^ Beutel, Allard. 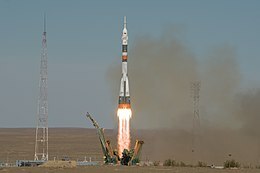 NASA Statement on Soyuz MS-10 Launch Abort. NASA. 2018-10-11 [2018-10-11] （英语）. ^ 澎湃新闻. 俄媒：联盟号事故后俄暂停载人航天 3人滞留空间站. 新浪科技. 2018-10-11 [2018-10-11]. ^ Soyuz FG FAILS during ascent – Soyuz MS-10 crew safe after ballistic entry abort – NASASpaceFlight.com. www.nasaspaceflight.com. [2018-10-11] （美国英语）. ^ Crew of Soyuz MS-10 lands in Kazakhstan after launch failure. Space Daily. [2018-10-11]. ^ Roscosmos reveals cause for Soyuz launch failure. AzerNews. 12 October 2018 [14 October 2018]. ^ Hodge, Nathan; Smith-Spark, Laura. Astronauts survive Soyuz rocket emergency landing. CNN. 2018-10-11 [12 October 2018]. ^ Soyuz MS-10 makes emergency landing after a launch failure. russianspaceweb.com. [12 October 2018]. ^ Burghardt, Thomas. NASA and Roscosmos trying to avoid an empty Space Station – NASASpaceFlight.com. NASASpaceflight.com. 18 October 2018 [19 October 2018]. ^ Bridenstine, Jim [@JimBridenstine]. 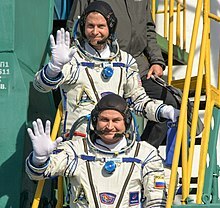 @NASA astronaut Nick Hague and Russian cosmonaut Alexey Ovchinin are in good condition following today's aborted launch. I’m grateful that everyone is safe. A thorough investigation into the cause of the incident will be conducted. Full statement below: … (推文). 2018-10-11 –通过Twitter. ^ NASA Live: Official Stream of NASA TV NASA TV, 2018-10-11. ^ Expedition 57 Crew Returns to Baikonur (NHQ201810110007) NASA at Flickr, 2018-10-11. ^ @Ruptly. *EXCLUSIVE* #SoyuzMS10 crew departs Baikonur for Moscow (推文). 2018-10-11 –通过Twitter. ^ Astronauts escape malfunctioning Soyuz rocket. BBC News. 2018-10-11 [2018-10-11]. ^ «Роскосмос» назвал дату готовности доклада об аварии «Союза». Iz.ru. 2018-10-17 [2018-10-22] （俄语）. ^ 美国航空航天局承认“联盟”号事故飞行属于航天活动. 俄罗斯卫星通讯社. 2018-12-04 [2018-12-04].